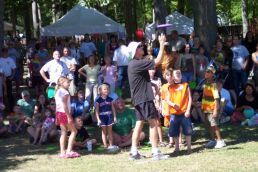 The Flying Aces Pro Frisbee Team is the ultimate outdoor entertainment for your fair, festival, circus or carnival. The high-flying stunts, tricks and acrobatics of The Flying Aces is ideal for open-air events, and is guaranteed to be a hit with audiences of all ages, even those always hard-to-please teenagers. The fun, friendly, athletic and wholesome Flying Aces show is self-contained and can be adapted to any area or event, venue or theme. If you’re an event planner, you’ll appreciate how little of your time and attention The Flying Aces will require. We’re easy to deal with. Need a "new act" for your event? Contact The Flying Aces today!